I often receive emails from artists seeking a guaranteed wage from some sort of Medici-like establishment. Historically, “working for the man” has advantages. 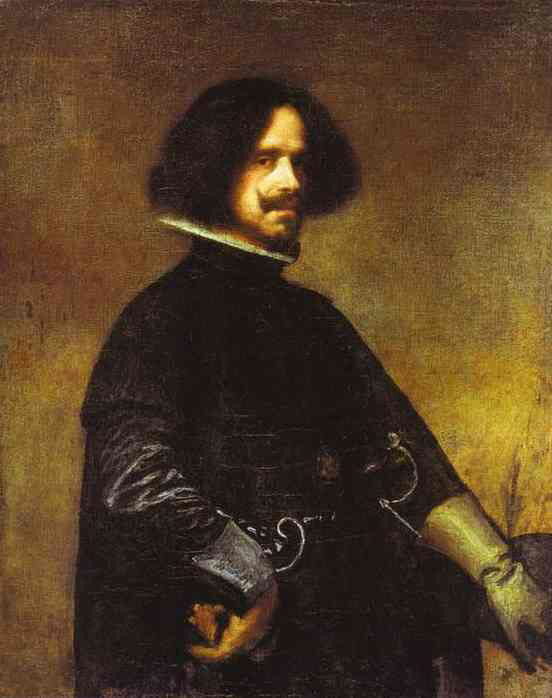 Take Diego Velasquez. 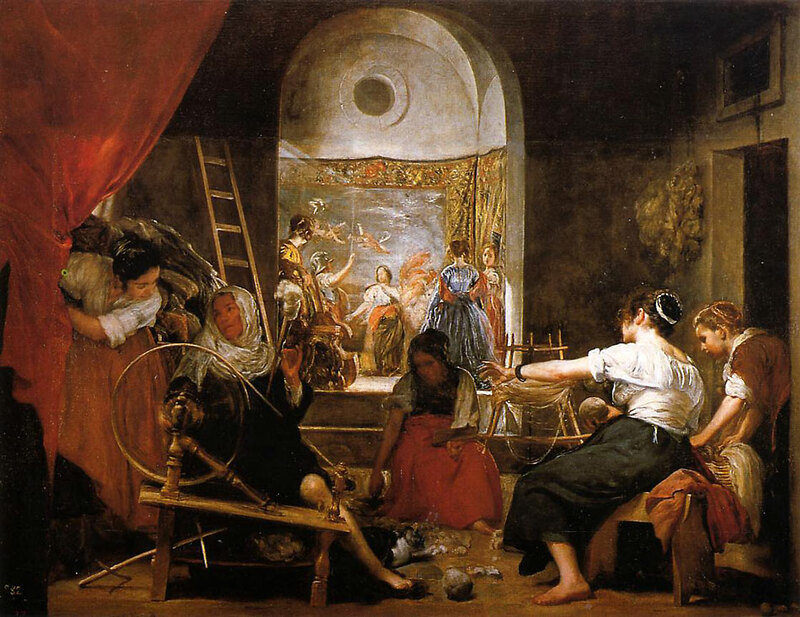 Arguably one of the greatest painters of all time, he was born to an upwardly mobile, semi-aristocratic Seville family in 1599 and was quickly apprenticed to first one and then another celebrated artist. Graduating from the first at age eleven, he went on to another and married into the family. 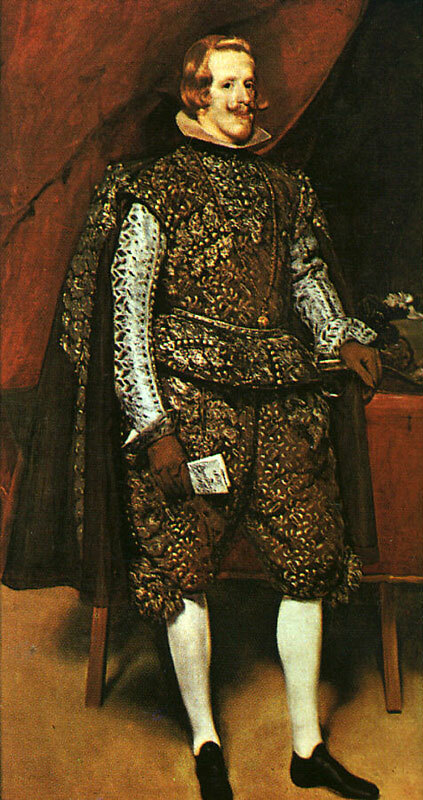 At age 23, through letters of introduction and political pull, he was invited to move to the royal court in Madrid. Guaranteed a living wage, health benefits and a domicile for his young family, he was soon named exclusive portraitist for Philip IV — “all other portraits by other artists to be destroyed,” said the king’s edict. 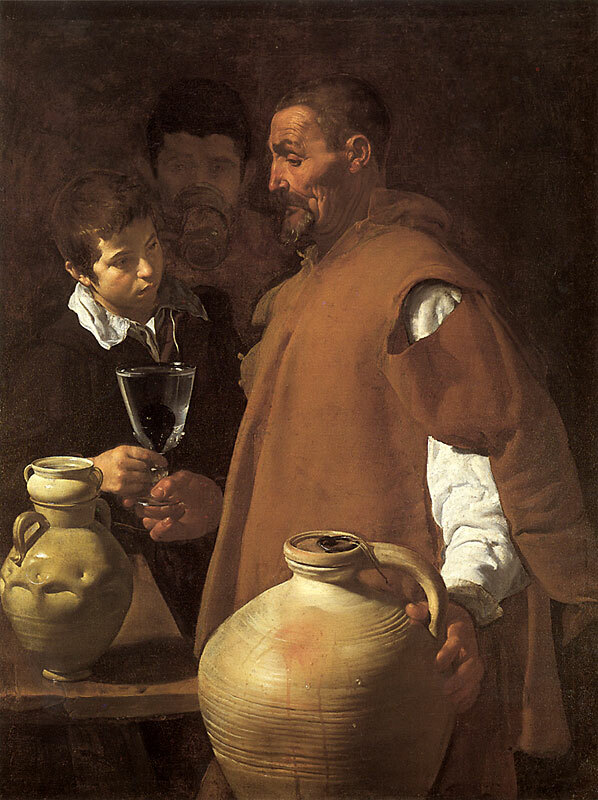 Velasquez was eventually to paint the king forty times. Hobnobbing with royalty suited him. Philip was fussy. 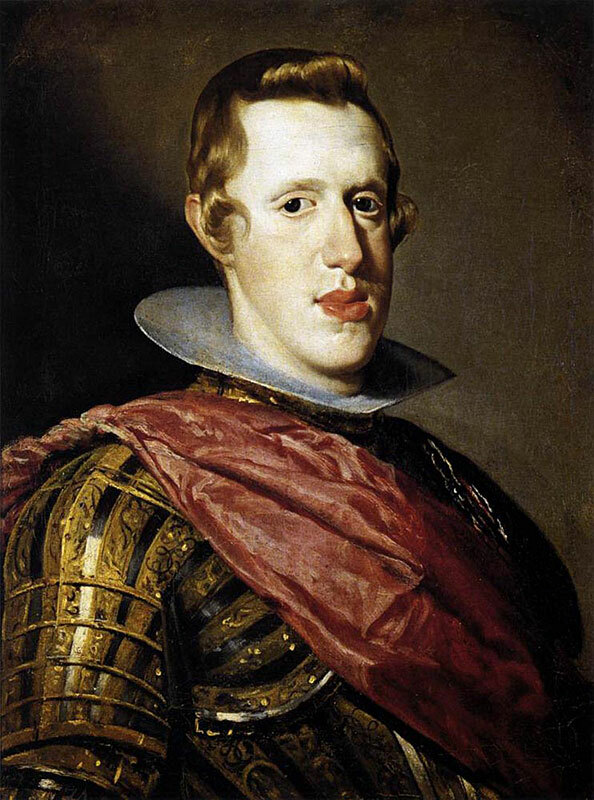 While Velasquez often depicted the king as an inbred pinhead, the court and the king loved him all the same. While generously supported, he was still the king’s vassal. On the occasions when he travelled to Italy to study, he had to go to the king on bended knee to get permission. 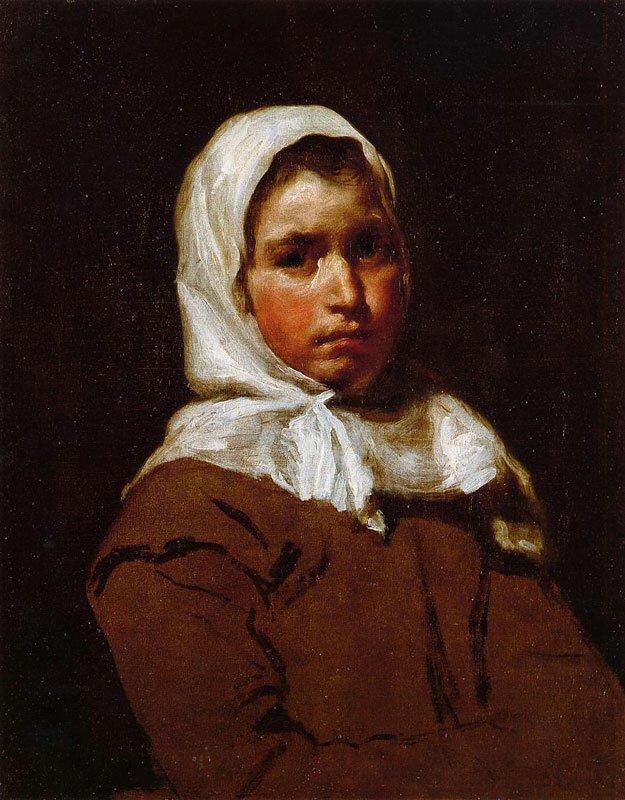 Velasquez took pains to bring his painterly prowess to the highest level. He pioneered unique systems, techniques and technology — for example, long-bristled and long-handled brushes. He learned to balance his need for personal growth and private sentiment with the needs of his patron. 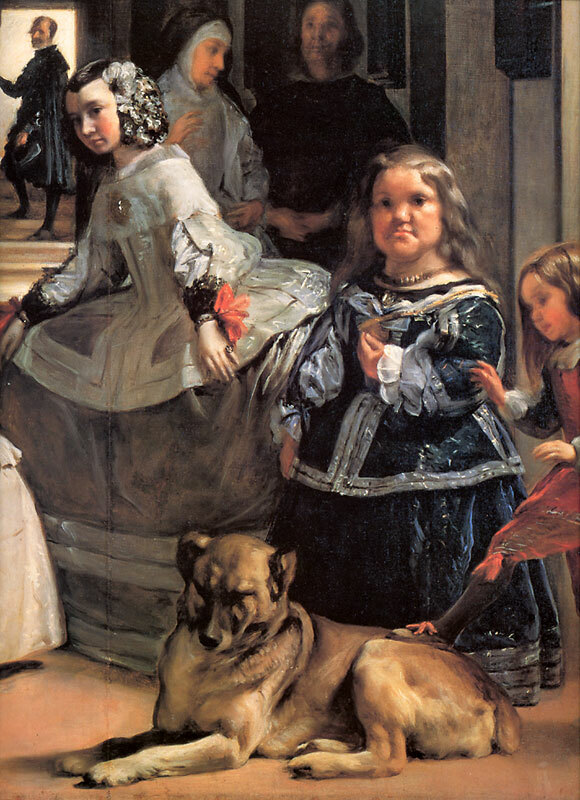 Throughout all of the royal intrigue, Velasquez never lost interest in the common people and the disadvantaged — children, dwarves, the aged. Nowadays, particularly with the gallery system and the wide range of commercial supports for artists, the single patron is largely a thing of the past. And while artists’ support systems tend to be more like mutual funds, there’s still the possibility of recourse to a “king of standards.” The artist continues to benefit from a fussy patron, but that patron is an ideal rather than a mortal one. Without him, artists can mire and sink into the muck of mediocrity. The idea is to be kept by a king whose concepts of excellence are as noble and demanding as you, the artist, can visualize. Be your own king and your support will follow. Esoterica: One advantage of working for folks in high places is that you get to hang out with them while they’re making history. 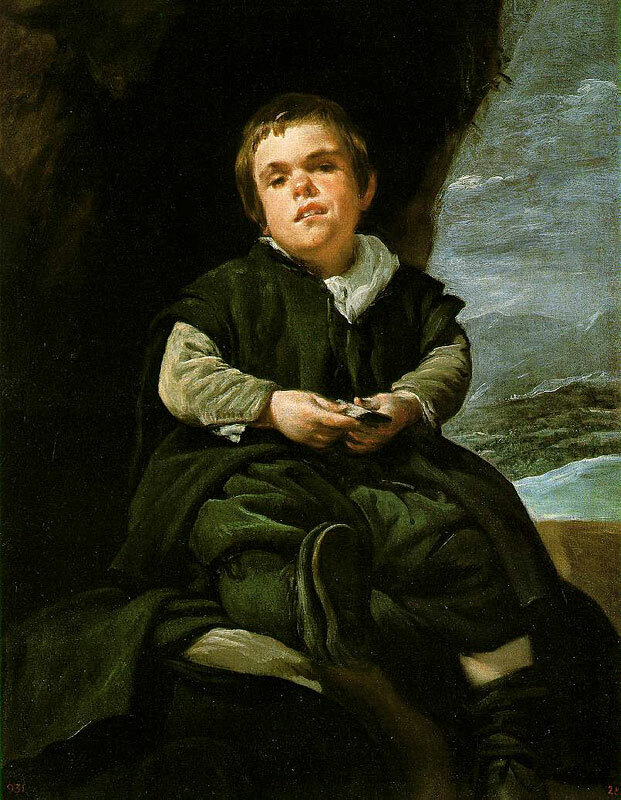 Velasquez frequently travelled with Philip and was likely present when the king entered Lerida as a conqueror. 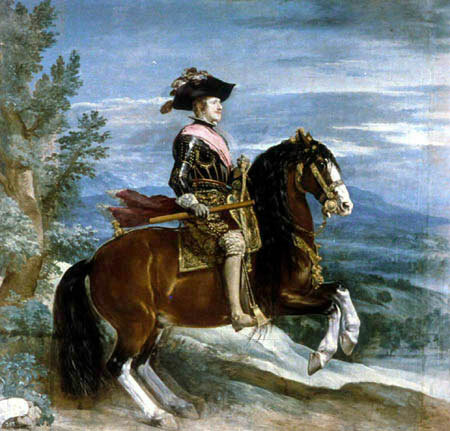 Velasquez painted a great equestrian work depicting Philip leading his troops — something Philip did only in parades. This brings us to the main problem with having a noble patron, other than an imaginary one — there’s the occasional tendency to muck about with the truth. Some artists may wish they lived in the time of Medici patronage but they should re-read Irving Stone’s biographical novel about Michelangelo,The Agony and the Ecstacy and they might think again. Michelangelo was buffeted about by high and mighty patrons who were by turns impossibly demanding, occasionally (and briefly) adoring, and often callously indifferent to some of the greatest art the world has ever known. We may think the grass was greener for artists in those days but reading about Michelangelo’s life reminded me that he didn’t have an easy time of it either. While you wrote of Velasquez’s loyalties to King Philip IV of Spain and his painting flattering portraits of the monarch, we shouldn’t neglect to mention that almost all of Renaissance art is church propaganda. I’ve painted a fair number of commissions of subjects I’d never in a million years choose to paint on my own, like the Muppets, but hey, a guy’s gotta eat. 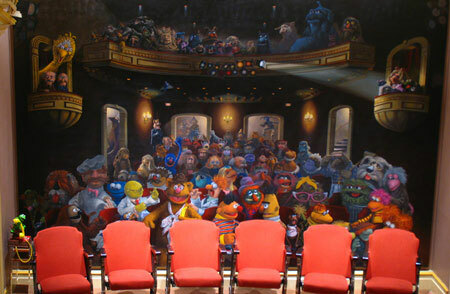 Besides, Jim Henson was a fun guy to gang out with. Does that make me feel like I prostituted my skills? Not for one second. I’m sure that Velasquez enjoyed the refinement of life at court and the money that being the King’s painter brought as I enjoyed the privilege of becoming Jim Henson’s friend. Nowadays, the artist is the prostitute to the gallery owner who can pick and choose without any motivation other than money and profit and who can discard the artist as quickly as he or she was chosen. The royal courts behaved in the same manner and not only with artists. 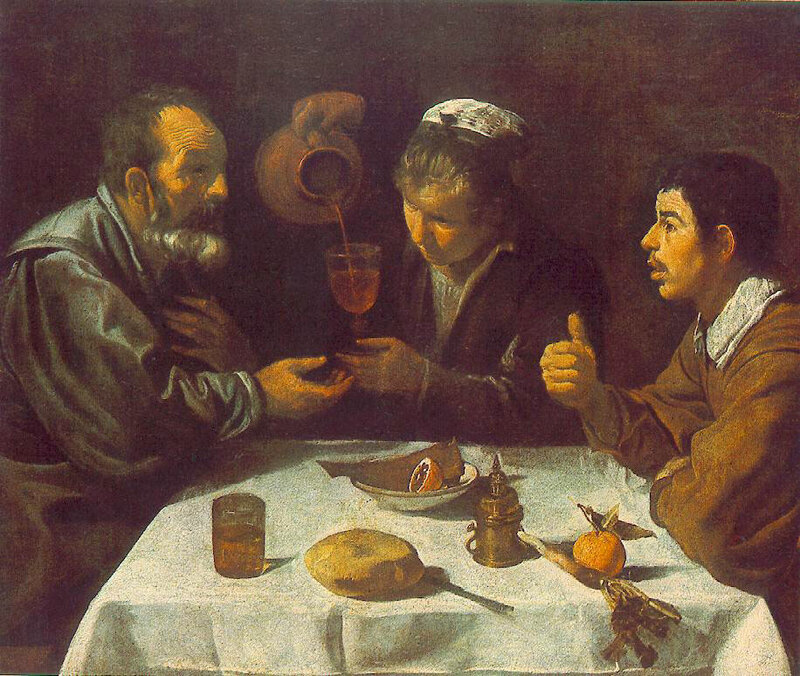 What about the guys who had their paintings destroyed when Velasquez came on the scene? How is it that where grants and incentives are available they tend to go to the established “in” artists? Is it mutual funds or mutual friends? In reading our current issue of Fast Company, we came across a short article that seems to have some value for artists. Dr. K. Anders Ericsson, professor of psychology, Florida State University, has studied and interviewed successful professionals for 25 years. The point he makes in his research is that most successful experts in a given field (say painting, for example) simply ‘do things differently’ from the rest. Bottom line: To continue to improve your art, you must create a situation where you intentionally seek out constant improvement. Seek out ways to stretch yourself. Seek out honest feedback. Be Deliberate. If you’re interested in K. Anders Ericsson’s research, get his book available online. 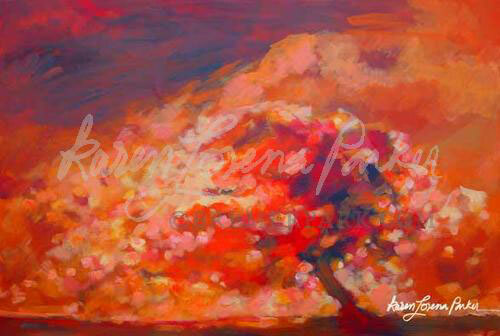 I’m in the somewhat rare situation of owning a gallery in which I sell the work of other painters as well as my own. Through the years I’ve heard a few (certainly not most) artists yearn for a patron to set them up with all the time in the world to make art, making them exempt from the quirks of the marketplace. I’ve also heard wannabe art collectors project their desires into an unrealistic future; “When I win the lottery, I’ll buy this painting.” They won’t hear of scaling down to a less expensive painting or discussing a time payment plan. For both the wannabe artist and the wannabe collector, it’s all or none: I want to have time to make art, but I don’t want to pay for the time. 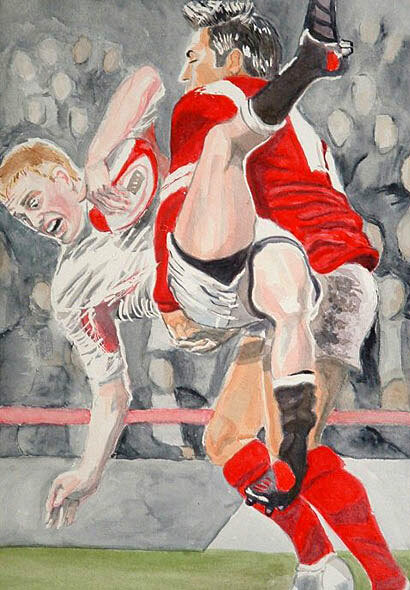 I want to have this painting, but I don’t want to pay for it. I want the money for it to come to me by magic. 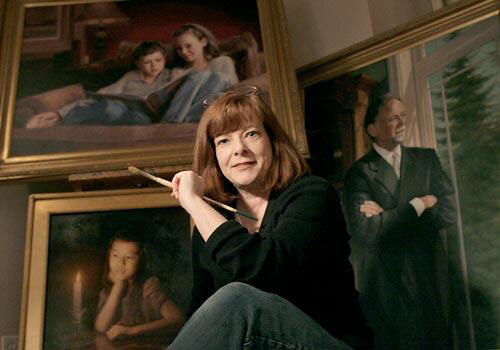 Both wannabes are living in a similar fantasy and make the gallery owner’s work difficult at times. Fact is most of us need to work to be able to purchase what we need and desire. We may sell paintings or pantyhose, or teach school, or drive trucks, or deliver pizzas. It’s a mistake to dream of a perfect future in which all of our dreams just come to us. In fact, sometimes those rare folks who don’t seem to have a financial care in the world, thanks to trust funds, rich spouses, and such, don’t seem to create that much. Could it be there’s something inspirational in the actual process of earning a living? Why should we as artists want to place ourselves outside of the workaday world? It is after all a very real part of life and it can certainly enliven our art. An artist gets his training from anywhere he can, maybe not from the best college or university. He works at a different job to earn money and bring up a family, but still works very hard at his art and eventually he becomes good, then tries to be a full time painter. Then, doors close in his face, he does not have the right degree, has not done study trips to famous European institutions, has not taught fine art, has no letters after his name, and has exhibited very little, but he is a better painter than many that have all of the above. But galleries cannot see his worth — or they see him as a threat against their official artists. This person — good quality, no name — has to sell for very little. The public wants the impressive CB’s to justify money spent and investment value. I find myself in this situation. How do you overcome this situation? We lost it in this daily jar and fret. Ready for us to fill it, soon or late. As I’m sure you’ve noticed, kings are few and far between. At 53, 30 years into mycreation/production experience, I can’t yet make enough on my art to support myself. I’m one step off the street. I’m lucky if I sell 1 or 2 pieces a year. The greater percentage of that goes back into my work. What’s left over gets me through a couple of months and then it’s back to (perceived) poverty. Right now I have $3.00 in my checking account and $26.00 in savings. And I haven’t paid my co-op dues this month. Through an odd set of circumstances I made a friend about 10 years ago who, after a time, realized that he both could help me and wanted to help me. And because of that connection/friendship I have a roof over my head, I’m not starving and I have access to a computer. I have some room to work but it’s literally right over the top of his living space. On a regular basis I have to put everything away to get it out of the way. So even though I’ve been able to continue to produce manically now for several years, there are drawbacks. And I am still a burden. So, what are those drawbacks? 1– I don’t have enough room to create anything large, including finishing several things that under a different set of circumstances, got constructed. 2– There’s not enough in-house storage so half of my materials and most of my own household items are in a storage garage. 3– I can’t afford to expand or do any real self-promotion. 4– Unlike half the human species, I’m not allowed to marry a sugar daddy. 5– Every single day I go further and further into both literal debt, and cosmic/karmic debt even though my patron/friend thoroughly enjoys my wicked sense of humor, my spiritually enlightened company and my ever-unfolding creative energy. I recently met a ceramic artist who said he’d been extraordinarily lucky. His mother and grandmother were both artists and he effectively inherited his grandfather’s house. And this family structure meant that at a very early age he was totally supported in his art creation experience. I had no such support. — In Ontario, 40% of grant recipients in a five year period received more than one grant. (Some received seven or eight, one artist 12). So, once you’ve won the grant game, you are likely to win again. — One artist has received more than $140,000 in government grants in four years. — Government grants are awarded through a “peer assessment” jury process. Of 15 randomly selected Ontario Arts Council jurors, 10 jurors had themselves received grants. 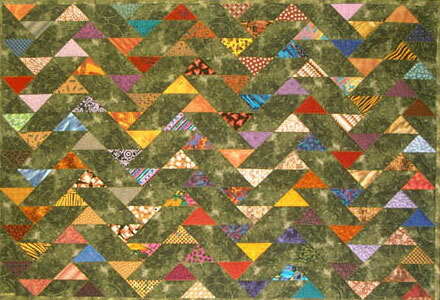 (So I suspect that the work that wins grants looks and feels like that of the grantor-jury). — In 2004, of 223 artists receiving grants in Ontario, only 69 were first time recipients. Is an artist who receives a grant a better artist than one who does not? Is an artist who receives seven grants seven times better than one who receives none? It is quite possible that we would still be admiring the work of Diego Velasquez today even if he had not had the benefit of patronage. But equally possible, I think, that he might be forgotten. How many artists’ work from two or three hundred years ago remains? How many artists were toiling away, and never “made it” to fame and maybe fortune? I suspect that the same stats hold true today: the vast majority of “cultural workers” will be forgotten, along with the accountants, barbers and bureaucrats. I find I am constantly picking hair from my brushes out of my paintings. They get stuck in the paint, and sometimes I can catch them early, but other times I find one that is buried in layers of paint and there is no hope of getting it out, unless I choose to sand down my paintings. Is there also any risk of having brush hairs trapped in the paint, archivally speaking? Or do items get sealed very well in acrylic medium. Just paint over them? 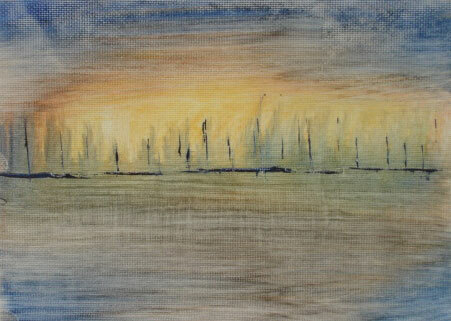 I can paint quite aggressively sometimes, and really don’t want to change what I’m doing. Is there a way to keep the brush hairs more intact? Do I add glue to the brush? (RG note) Thanks, Karen. Don’t add glue to the ferrule. Generally speaking, better quality brushes these days have the bristles going deeper into the ferrule and are not so prone to losing them. Also, most of the better synthetic hair brushes don’t lose many — even with wild and scrubby handling. Having said that, I used to be a lot more fussy about hair left behind. The odd hair doesn’t bother me anymore — particularly if one is into broad handling. The hair left behind is evidence that you were there. Have you ever seen a hair sticking out of a photo litho? 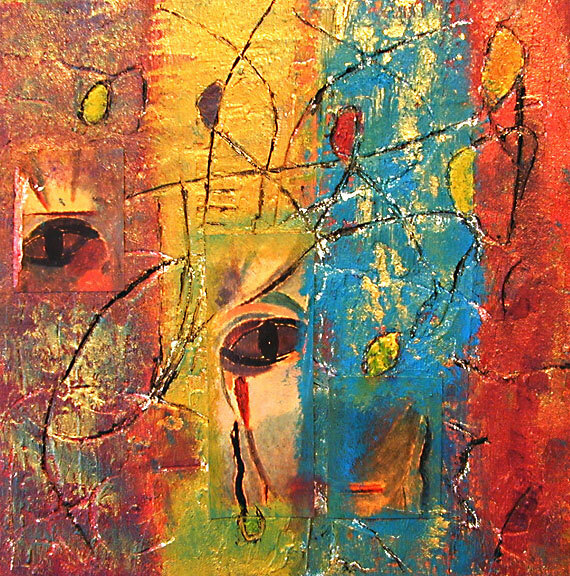 I appreciate your email, especially because I want to find a place where I can find a very low-cost, affordable artist’s studio, and/or some sort of patronage that would allow me the open time, space, and resources to be able to create literary arts: fine arts, crafts, design, fine custom sewing, performing arts, domestic arts, healing arts, making of inventions and innovations. I’d like to find a multidisciplinary artists’ colony where I could live long term. Do you have any suggestions on where to find this? (RG note) Thanks, Teresa. And thanks to everyone who wrote with the same question. You forgot to mention free meals, spending money and a cleaning man. If anyone knows of such a place, please let Teresa know about it. Copy it to us and we’ll pass it around to all the others. Free. 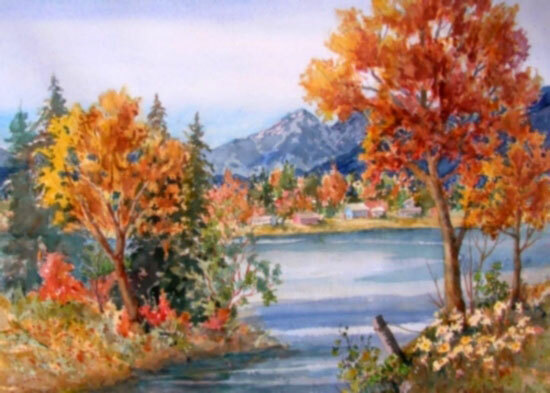 You may be interested to know that artists from every state in the USA, every province in Canada, and at least 105 countries worldwide have visited these pages since January 1, 2006.